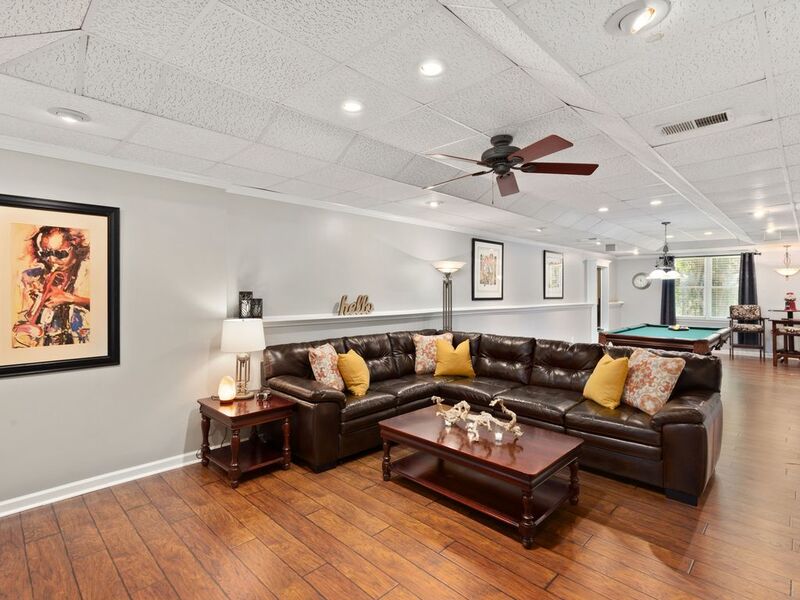 Newly remodeled full daylight lower level with great decor and private entrance! My place is a one bedroom luxury suite (lower level) in a quiet secluded neighborhood that is safe for walking, 5 minutes to I-575, 10 minutes to the Shoppes of Atlanta outlet mall and only 30 minutes to the new Sun Trust Atlanta Braves stadium. The suite is spacious with over 1400 SF of living area, fully equipped kitchen, full bath, media room with pool table, TV, Netflix, Wi-Fi, workout room, maximum privacy and more. In addition, the suite has a private entrance! You will be able to access the lower level only. There is a private walkway from the driveway to the private entrance which is secured by a smart lock/code. Please be aware the walkway has a slope as shown in the photo. Those with mobility limitations may have a challenge coming up and down the walkway. My home is close to Marietta, Kennesaw, Roswell, and Woodstock. Downtown Atlanta is a short 45 minute drive. In addition to the Shoppes of Atlanta outlet mall, there is a wide variety of restaurants in the area and Lake Allatoona is approximately 5 miles away. Please review the house rules before booking. I am and IT professional working in the Healthcare industry. I have been hosting guests in my home for a over a year and have truly enjoyed the experience. It is my desire that all who stay in my home enter as guests and leave as friends. I look forward to hosting you! Large bathroom with full size walk-in shower. Wifi and NetFlix is available. You will have access to enjoy other apps on the 55-inch TV in the media room. Kitchen is fully stocked with dishes, pan, utensils, etc. Music is available through the TV and music apps. We came to Atlanta to visit with family over the Christmas holiday. This VRBO delivered the clean and comfortable environment we hoped for and so much more. Elegantly furnished and tastefully designed, the rooms were spacious and bright and immaculate. Vanessa was extremely attentive to our needs without being intrusive. The extra amenities like drinks and snacks, and big fluffy towels were thoughtfully provided and much appreciated. We didn't do any cooking but the kitchen was well adapted and supplied for cooking your own meals. This property is a renovated ground level basement (although it doesn't feel at all like a basement) in an upscale quiet neighborhood with lots of trees and well manicured lawns. Very private, with a good location.to the northern Atlanta areas. Access to the property is down a fairly steep walkway which might be a challenge for a disabled person. We needed a place to stay for an extended in the Canton area. Finding Vanessa’s basement apartment was just perfect for us. The apartment has everything we needed for our extended stay. A wonderful and comfortable bedroom with a comfy queen bed. The living room has two comfortable couches and a big TV with plenty of channels. The very adequate kitchen has all the equipment we needed. There us a BBQ and a nice dining table on the patio. Every two weeks a house cleaner comes to thoroughly clean the apartment. Perfect. Vanessa is a wonderful host. She has given us privacy but is always available if needed. We would highly recommend Vanessa’s apartment to anyone.